Moderation is a process designed to ensure equitable assessment processes among all offerings of a unit, whether on campus, online or offshore. The ECU Assessment, Examination and Moderation Procedures mandate that moderation procedures must ensure reliable judgement in relation to benchmarked standards during all phases of the assessment cycle. The Higher Education Standards Framework (Threshold Standards) 2015 requires that all accredited courses of study are monitored and reviewed in relation to methods for assessment of learning outcomes and grading of students’ achievement of learning outcomes. 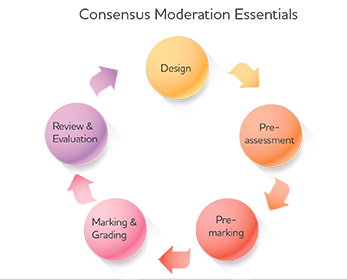 The process for ensuring progressive consensus moderation is documented in the Consensus Moderation Essentials resource below. Note that the requirement to be able to demonstrate the integrity of assessment practices (and confidence in standards) applies to all courses and units, even where there is only one marker. Integrity of assessment is a factor of both the validity of assessment instruments and the reliability of assessment and grading practices. Validity is about whether assessment tasks assess what they were designed to assess, and are aligned with benchmarked learning outcomes. Reliability is about ensuring consistent judgements about standards, so that different assessors, acting independently using the same marking criteria, would award the same level of achievement to student responses with the same characteristics. It is also about the same assessor making the same judgement consistently over time. Moderation activities must be reported in ECU’s Marks Recording System (MRS). Examples of comments are provided in the Reporting Moderation Activities resource below.